Designers have a sure-fire, inexpensive and straightforward secret when it comes to transforming the appearance of any room into something spectacular — color. With a few splashes of paint or a couple of well-chosen accessories, you can make a tremendous difference in the way a room looks. Whether you are decorating a new home or want to update your existing drab decor without spending much money, a bringing in a new color can make a tremendous difference to a dated style. 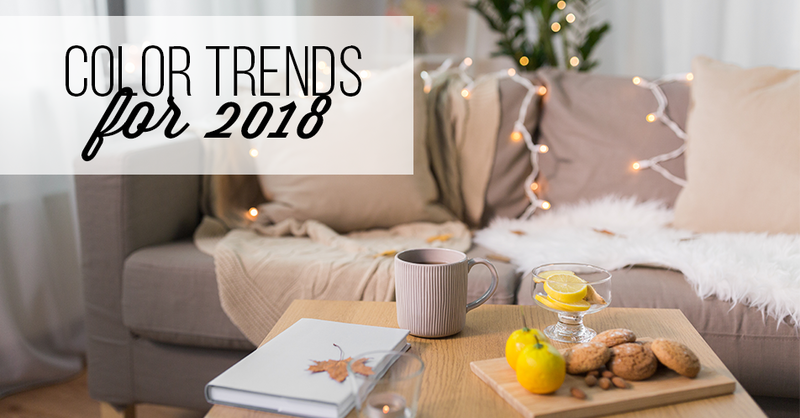 Discover a few of these significant new color trends for the fall of 2018 which will delight you and your guests. Do you usually play it safe by selecting neutral colors schemes for your home? Now is the time to stop being afraid and embrace a more daring color palette. Today’s top decorating trend is all about eye-catching color choices. Some favorite bold colors which decorators are in love with this season include tantalizing choices such as vivid purples, rich crimsons, and Mediterranean-inspired topaz. For those who are fearful of overwhelming a space with too many bold color choices, they may want to consider painting a single accent wall, using a single statement piece of furniture or buying several standout throw pillows. Nothing says fall like faded greens and oranges, rich golds or lush brown hues. You don’t have to abandon these tried-and-true seasonal favorites completely to update your room. All it takes is choosing the right shades. This autumn, a few of the hottest colors are more subdued. These include Martini Olive, a green-gray reminiscent of Army Green; Russet Orange, a dark and soft tone; Ceylon Yellow, the color of exotic spices, and Red Pear, a lusciously rich reddish-brown. Combining different colors in a small space is challenging even for an expert. There are a few suggestions for which 2018 colors work well together. Washed-out pinks and dark grays. Combining feminine and masculine colors give a room sophistication as well as a relaxed feeling. Charcoal and burnt orange. This is a dark and brooding color combination which is perfect for a more modern style. Vivid purple and pale green. Bringing elements of the natural world as well as a regal flair into a room with this usual combination. Whether you are looking for unique furniture to complete a home remodel or need to pick up a few accent pieces to brighten a space, Wickmans Furniture, just minutes from Thousand Oaks, CA, is where you want to go. Stop by the showroom to browse through an extensive inventory of home furnishing from some of the biggest brands at low prices. Call 818-991-4800 to find out how Wickmans Furniture can help you.